Founder, The Sankara Nethralaya Academy. 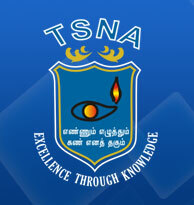 The SN Academy (TSNA) is avowed to employ a system of educating people in a community or society, in schools, arts & science colleges, imparting knowledge through instruction courses, training classes, and usher in newer training/teaching methodologies including the use of Information Technology. The objective is to teach courses that deal with A to Z in healthcare services. LOGO: Amidst numerous entries, we have selected the logo which extols education. It proclaims that Education is as important as the eyes — just as light dispenses darkness, Education dispenses the darkness of ignorance. DIPLOMA: Certificates and fellowships for educational programmes of various durations would be awarded by the academy at the end of successful completion of the course. Importance to practical training would be of utmost importance definitely necessitating smaller number of students per class and longer duration of courses. Both Distance education programme and residential form of education would be imparted. TEACHING AND TRAINING: Most of the teaching and training is planned to take place at the main campus of the Academy. If some corporate houses require our programme to be conducted in a place other than our headquarters, the same can be considered. We are at present doing a training course for “Titan” for their Titan Eye Plus. Our team would travel out to impart knowledge. E-EDUCATION: Some of the basic and fundamental courses shall be conducted by E–Education methodology. However for the practical and hands on training the facilities at the SN hospitals shall be utilized. JOB OPPORTUNITIES: Healthcare industry is likely to expand exponentially. A candidate trained at the Sankara Nethralaya Academy would be at an advantage for having gained a certificate from a well-known institution, besides having gained greater practical knowledge and skill.